Everything Just So: Won’t You Join Me for #SundayBrooch, #GraceofMonacoMonday or #RubyTuesday? Won’t You Join Me for #SundayBrooch, #GraceofMonacoMonday or #RubyTuesday? A magnificent Van Cleef & Arpels clip in window of Fifth Avenue boutique, July 2015. Since I started my Instagram account last month I have been having a great time learning how it works, seeing all the lovely and fun photos people post, and discovering new ways to connect with writers, bloggers, costume designers, stylists, and photographers. You can find me @everythingjustjewelry. A big reason I wanted to join in on the fun over there was because I have a fairly large database of jewelry photos that I have taken since 2011, when I attended the landmark exhibit Set in Style: The Jewelry of Van Cleef & Arpels at the Cooper-Hewitt in Manhattan. Most of the photos I took have never made it to the blog since I figure you can only post so many pictures before reader fatigue sets in! However, it seems a shame not to share them—in the case of the Van Cleef & Arpels show, as well as the 2013 show Jewels by JAR, those exhibits came together using pieces from the collections of hundreds of different people and will probably never be replicated again. 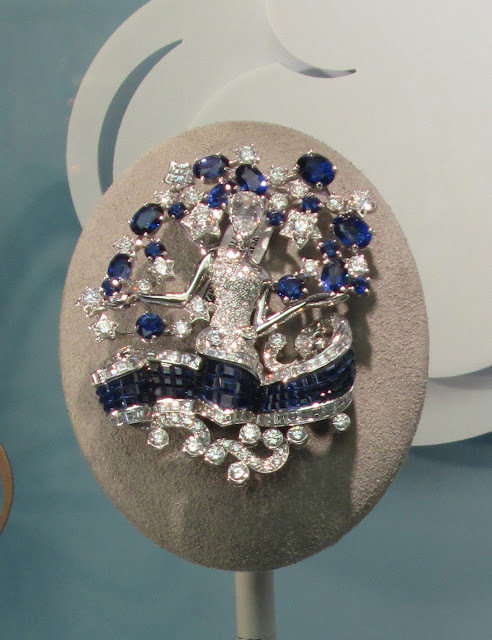 I want to share the jewelry that has dazzled me in the past four years as well as the new pieces I find as I attend jewelry shows and exhibits, and of course, swing by all my favorite jewelry haunts on Fifth Avenue in Manhattan, like Van Cleef & Arpels, which had the two brooches shown here in their windows over the summer. Amazing! Another VCA clip. I love the mystery setting of the sapphires in the cape! A couple of hashtags I will be posting under will be #SundayBrooch, #GraceofMonacoMonday, and #RubyTuesday. I didn't come up with any of those names, they already exist, I am just adding to the fun. I would recommend looking at #ElizabethTaylorTuesday too, if you have the time, I have seen some great pictures of Liz (sometimes with her jewels! ), under that tag. 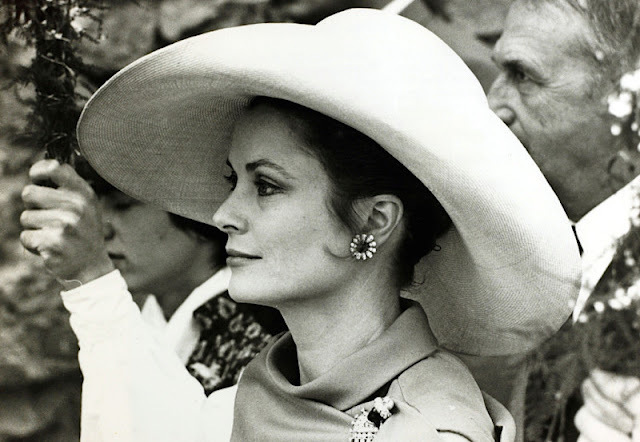 In the past few months I have really become a fan of the brooch collection belonging to Princess Grace and I loved this particular photo below of her looking so glamorous while wearing one of them. 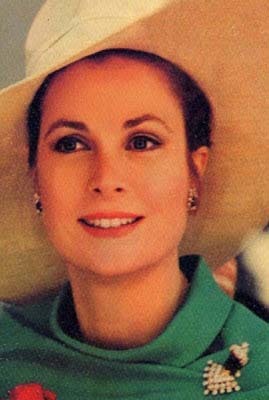 Such a wonderful photo of Princess Grace wearing one of her Blackamoor brooches. The photo below is the one I posted to Instagram last week. In color, and a better shot of the brooch. I am also going to post under #RubyTuesday since rubies are one of my favorite stones. I never get tired of this 1967 Van Cleef & Arpels ruby and diamond floral clip once owned by Maria Callas. And after looking through my other Van Cleef & Arpels picture from the same exhibit, I realize I have a lot more ruby pictures where that came from! 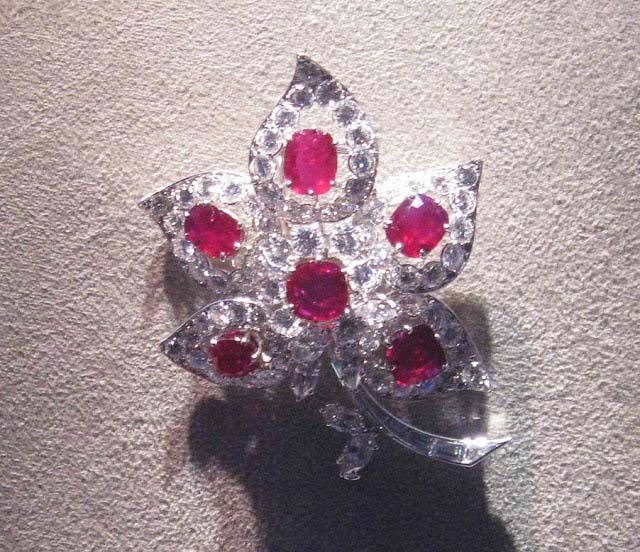 A 1967 Van Cleef & Arpels ruby and diamond flower clip. Superb! If you ever have a moment, swing by Instagram and see the photos I post! If you are new to IG like I am, let me know your handle and I will come follow you. If you have any hashtag addresses I should check out, or you think I should use, let me know what they are! The Blackamoor broach is from Nardi's in Venice, not VC&A. I would love to see these up close. Thanks for featuring them, Jill. Hello Anon, I identified the brooch as being from Cartier, not VC&A. If it was from Nardi's instead, I thank you for the correction! 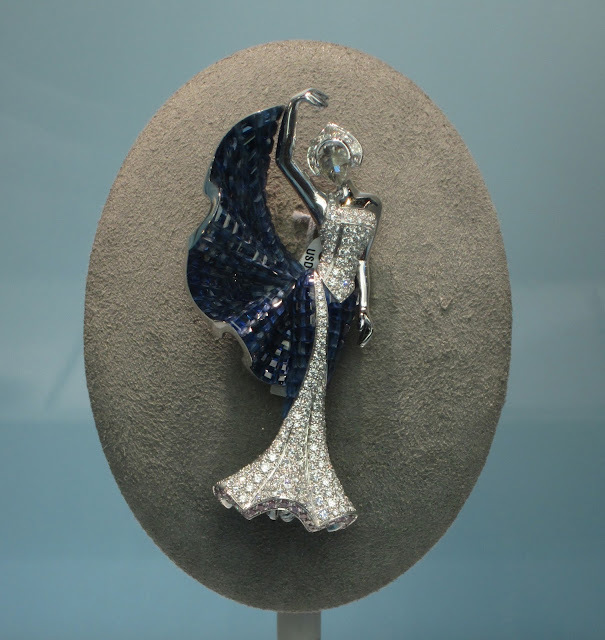 There are very similar brooches in the book "Amazing Cartier." Thanks for your help, I am still learning!